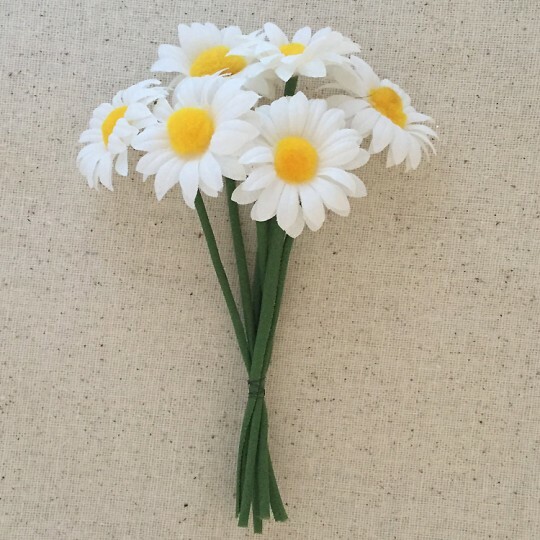 Bundle of 6 old store stock white fabric daisies with yellow fuzzy centers. Daisies measure 1-3/8" across and have tubed fabric stems measuring 5". Old store stock made in Germany. 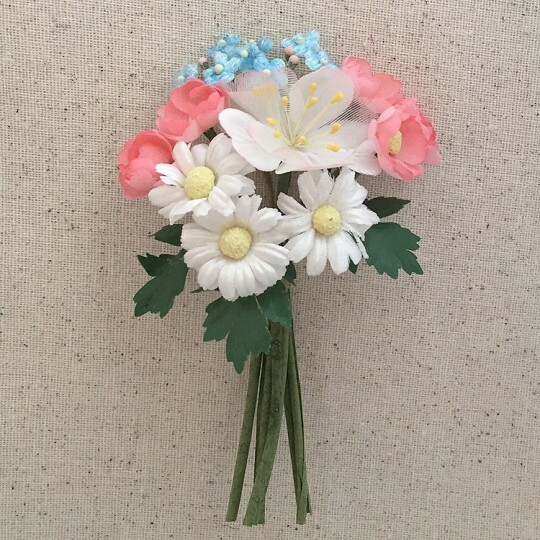 Bundle of 6 old store stock assorted vintage fabric flowers in pastel colors. Flowers are a mix of gauze, velvet and fabric. Bundle measures 5" long overall. Old store stock made in Germany. 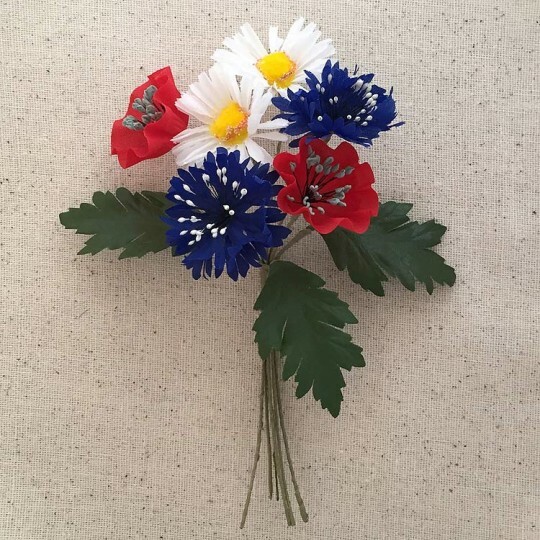 Bundle of 6 old store stock Bavarian wildflowers -- 2 red poppies, 2 white daisies, and 2 blue bachelor buttons. 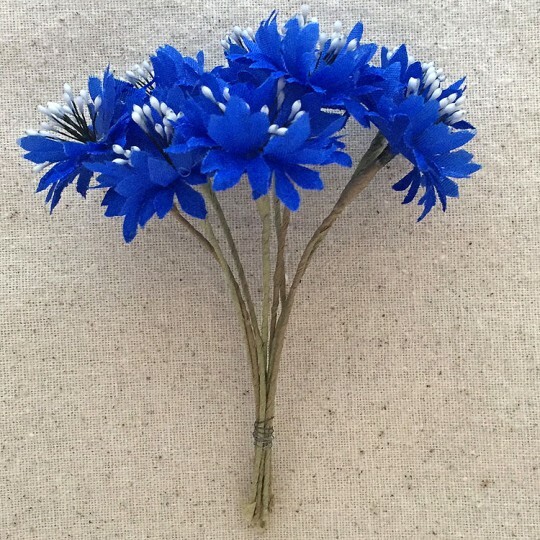 Daisies measure 1-3/8" across. Bundle measures 6" long overall. Old store stock made in Germany. 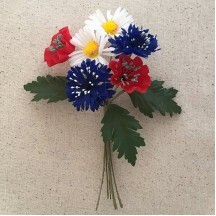 An exquisite addition to patriotic celebrations. 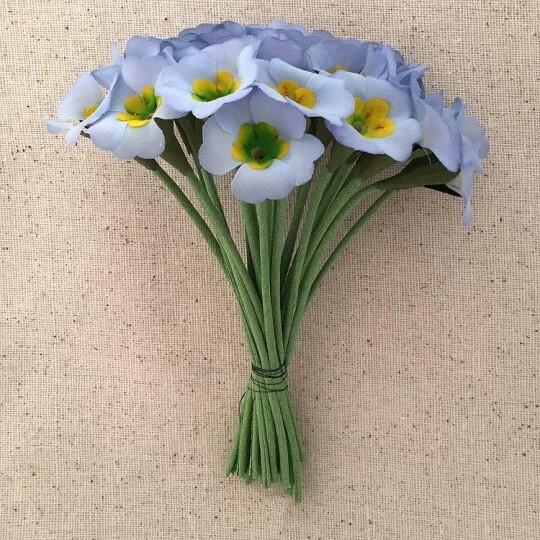 Bundle of 24 old store stock vintage fabric primroses in light blue. Blossoms measure approx. 1" across with green fabric stems measuring 4-3/4" long. Old store stock made in Germany. Bundle of 24 old store stock vintage fabric primroses in white. Blossoms measure approx. 1" across with green fabric stems measuring 4-3/4" long. Old store stock made in Germany. Bundle of 10 old store stock vintage fabric roses in a beautiful shade of purple. Blossoms measure approx. 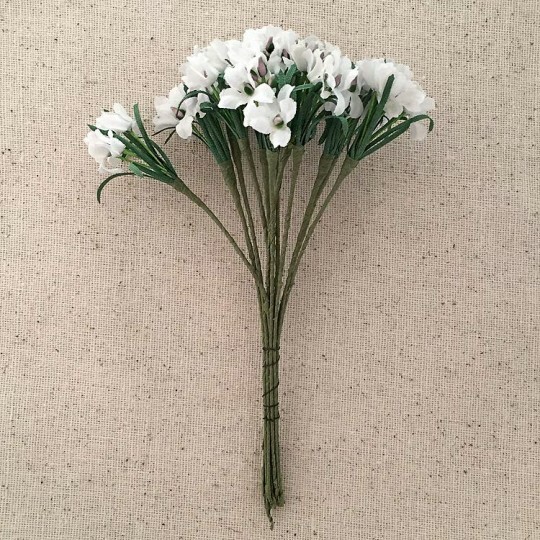 1" tall with 4" green wired tube stems. Old store stock made in Germany. 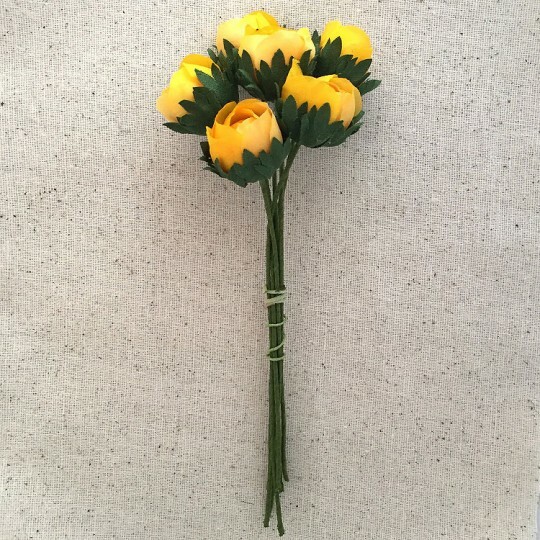 Bundle of 12 old store stock vintage fabric roses in two shades of yellow. Blossoms measure approx. 1" across with green wired stems measuring 5" long. Old store stock made in Germany. 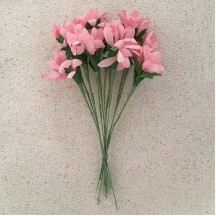 Bundle of 6 old store stock vintage fabric flowers in a beautiful pale pink ombre. 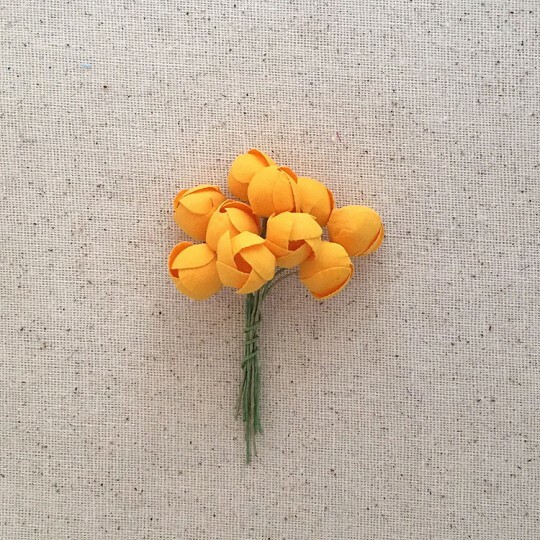 Flower centers are quite pretty with yellow stamen. Blossoms measure approx. 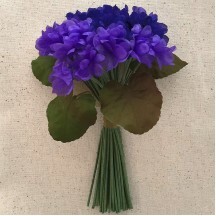 1-1/2" tall with 4" green wired stems. Old store stock made in Germany. 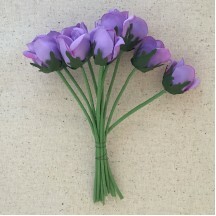 Bundle of 6 old store stock vintage fabric roses in a beautiful pale purple. Gossamer blossoms measure approx. 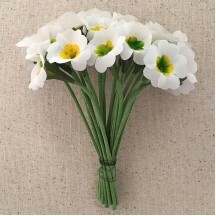 1-1/2" tall with 4" green wired tube stems. Old store stock made in Germany. Bundle of 6 old store stock vintage fabric flowers in white with some pale pink on the edges. 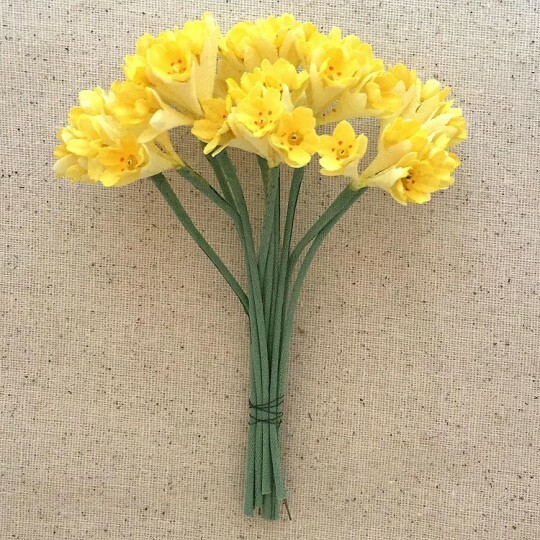 Flower centers are quite pretty with yellow stamen. Blossoms measure approx. 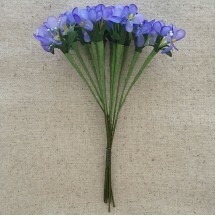 1-1/2" tall with 4" green wired stems. Old store stock made in Germany. 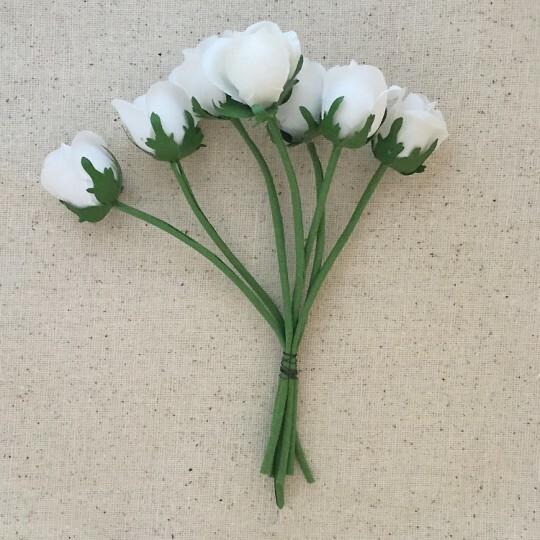 Bundle of 7 old store stock vintage fabric roses in white. Blossoms measure approx. 1" tall with 4" green loose tube stems. Old store stock made in Germany. Bundle of 12 old store stock vintage fabric flower stems with 3 pink flowers per stem. Blossoms measure approx. 1/2" to 3/4" across with green wired stems measuring 4" long. Old store stock made in Germany. Bundle of 12 old store stock vintage fabric wildflower stems with 4 white flowers, peps and strappy leaves per stem. Blossoms measure approx. 1/2" across with green wired stems measuring 4-1/2" long. Old store stock made in Germany. 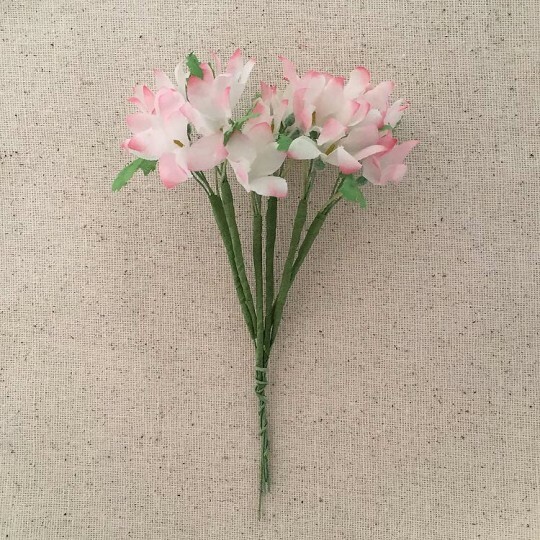 Bundle of 6 old store stock vintage fabric flower stems with 3 light pink and white ombre flowers and two leaves per stem. Blossoms measure approx. 1/2" to 3/4" across with green wired stems measuring 4" long. Old store stock made in Germany. Bundle of 36 old store stock vintage fabric violets in two shades of purple -- medium and dark. Blossoms measure approx. 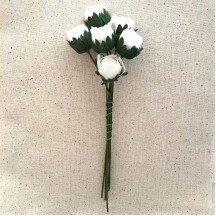 3/4" to 1" across with green fabric stems measuring 6-1/2" long. 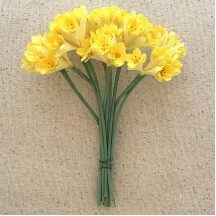 Bundles also have 5 green fabric leaves measuring 2" wide. Old store stock made in Germany. 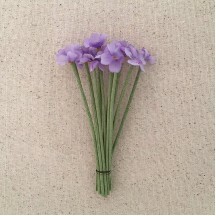 Bundle of 12 old store stock vintage fabric violets in two shades of light purple. Blossoms measure approx. 1/2" across with green fabric stems measuring 3" long. Bundles also have 3 green fabric leaves measuring 1-1/2" wide. Old store stock made in Germany. 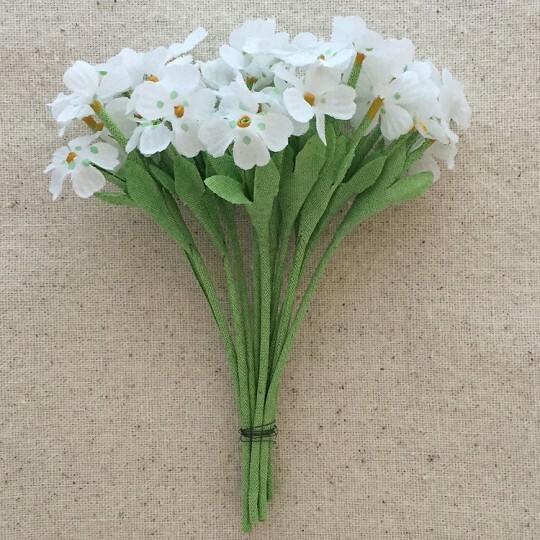 Bundle of 12 old store stock vintage fabric violets in pale green. Blossoms measure approx. 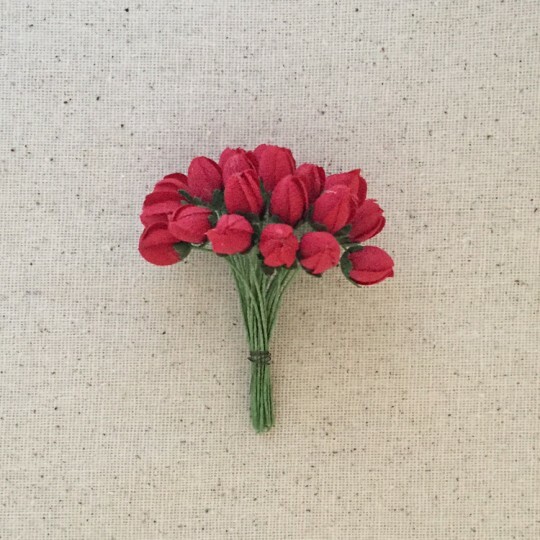 1/2" across with green fabric stems measuring 3" long. 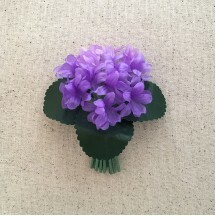 Bundles also have 3 green fabric leaves measuring 1-1/2" wide. Old store stock made in Germany. 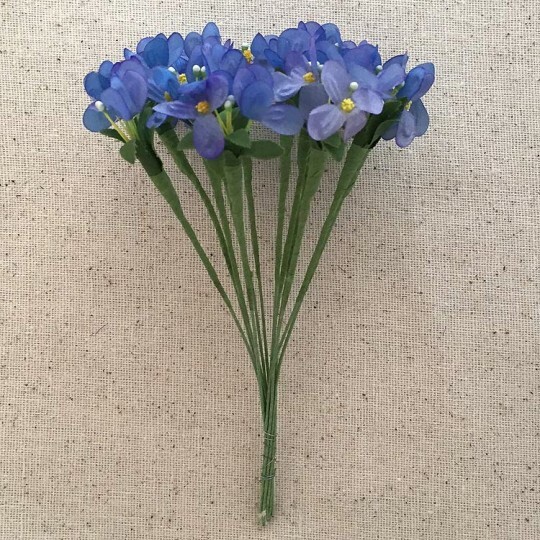 Bundle of 12 old store stock vintage fabric forget me not stems in blue ombre. 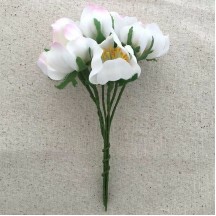 Each stem has 3 flowers with peps and greenery. Blossoms measure approx. 1/2" across with green fabric stems measuring 5" long. Old store stock made in Germany. 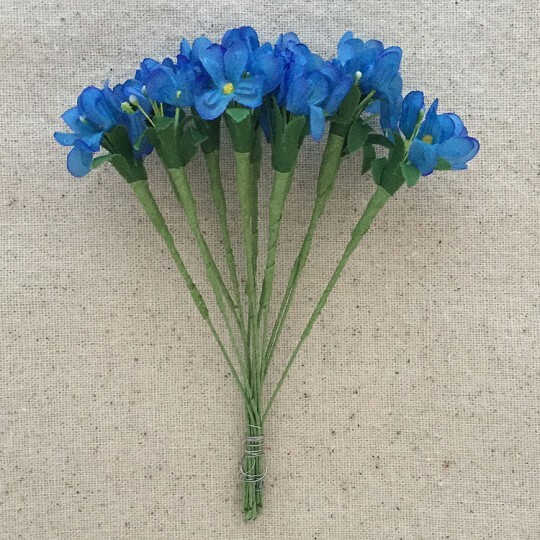 Bundle of 12 old store stock vintage fabric forget me not stems in cerulean blue ombre. Each stem has 3 flowers with peps and greenery. Blossoms measure approx. 1/2" across with green fabric stems measuring 5" long. Old store stock made in Germany. 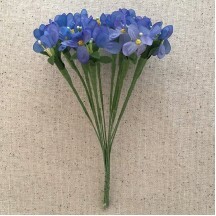 Bundle of 12 old store stock vintage fabric forget me not stems in lavender ombre. 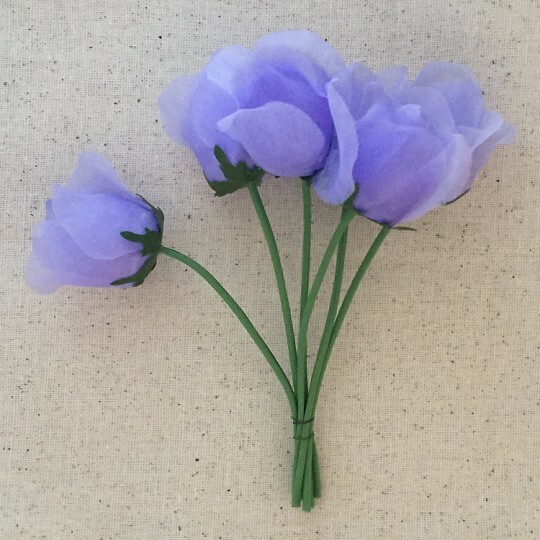 Each stem has 3 flowers with peps and greenery. Blossoms measure approx. 1/2" across with green fabric stems measuring 5" long. Old store stock made in Germany. 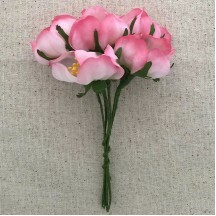 Bundle of 12 old store stock vintage fabric forget me not stems in pink ombre. Each stem has 3 flowers with peps and greenery. Blossoms measure approx. 1/2" across with green fabric stems measuring 5" long. Old store stock made in Germany. 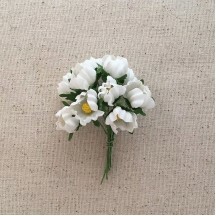 Bundle of 24 old store stock vintage fabric blooming stems in white . Each stem has 3 flowers with peps and greenery. Blossoms measure approx. 1/2" wide and the stem measures 6" long overall. Old store stock made in Germany. 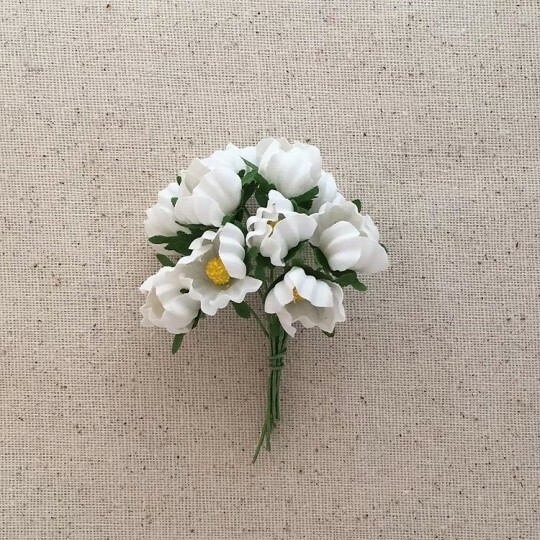 Bundle of old store stock vintage fabric flowers in white with hand painted green dots. There are 12 stems with 3 flowers per stem. 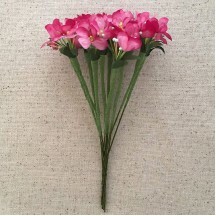 Flowers measure 3/4" across on green fabric tube stems measuring 4" long. Old store stock made in Germany. 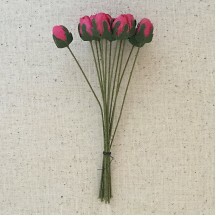 Bundle of 12 old store stock vintage fabric rose buds in pink. Buds measure approx. 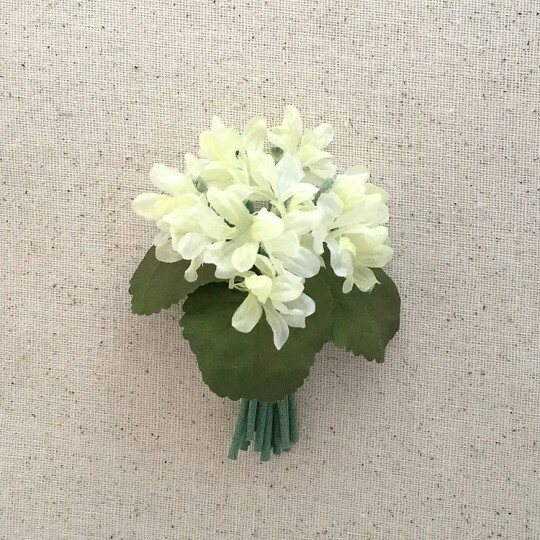 3/4" tall with green stiff fabric stems with wires measuring 4" long. Old store stock made in Germany. 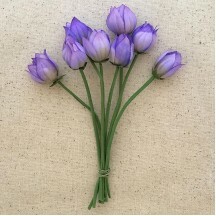 Bundle of 8 old store stock vintage fabric crocus buds in purple. Buds measure approx. 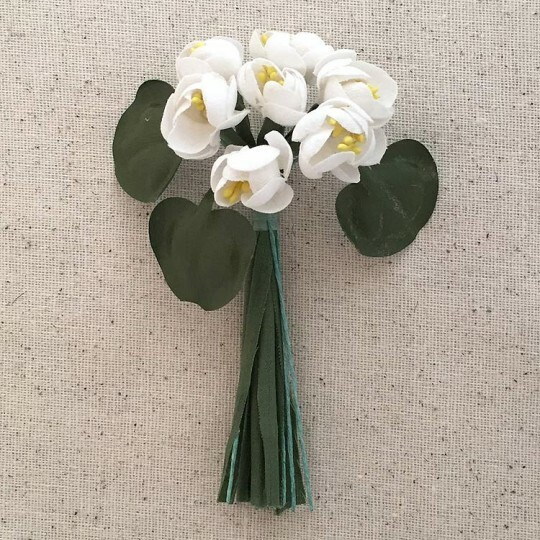 1" tall x 5/8" wide with green soft fabric stems measuring 4" long. Old store stock made in Germany. Bundle of old store stock vintage fabric bachelor button flowers in blue. 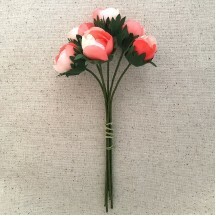 There are 8 flowers measuring 1-1/4" across on brown paper wrapped wire stems measuring 4" long. Old store stock made in Germany. 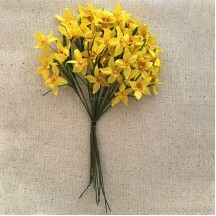 Bundle of old store stock vintage fabric campanula flowers in yellow. 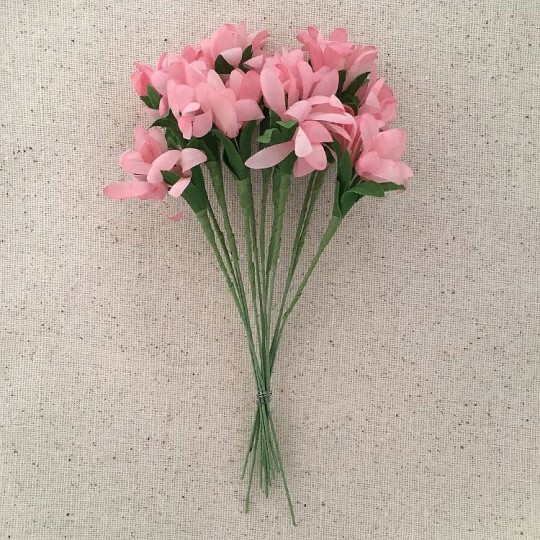 There are 10 stems with a cluster of 5 flowers per stem -- Flowers measure 3/4" high x 1/4" across with the cluster of five measuring about 1" across. 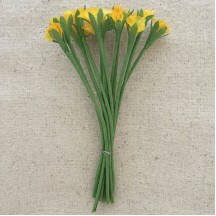 Green soft fabric stems measure 4" long. Old store stock made in Germany. 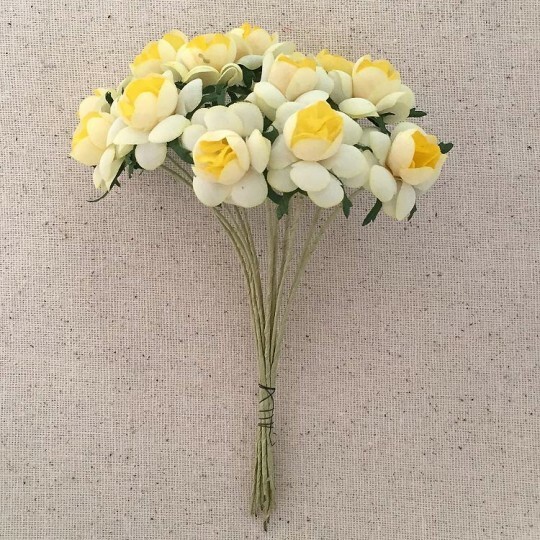 Bundle of old store stock vintage fabric flowers in yellow. There are 12 flowers measuring 1" across on green fabric tube stems measuring 4-1/2" long. Old store stock made in Germany. 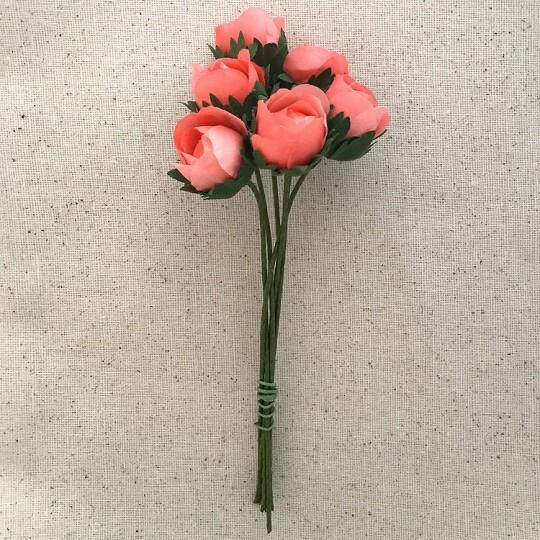 Bundle of 6 old store stock vintage fabric flower buds in peach. Buds measure approx. 5/8" across with green stiff fabric stems with wires measuring 4-1/2" long. Bundle also has 3 glossy leaves measuring 1-1/4" across. Old store stock made in Germany. 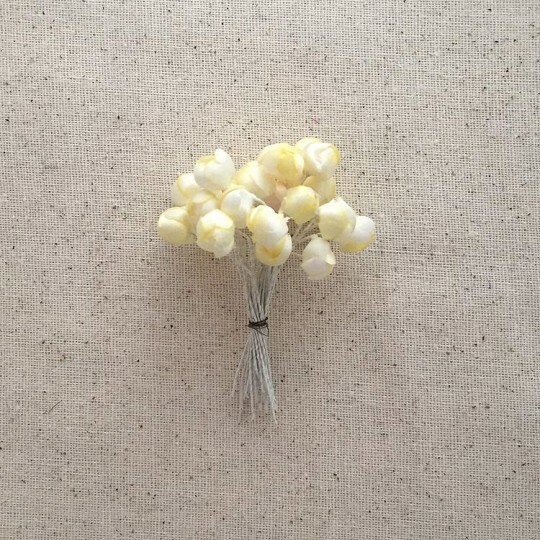 Bundle of 6 old store stock vintage fabric flower buds in white. Buds measure approx. 5/8" across with green stiff fabric stems with wires measuring 4-1/2" long. Bundle also has 3 glossy leaves measuring 1-1/4" across. Old store stock made in Germany. 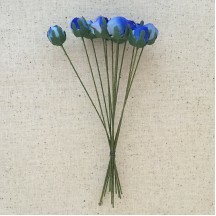 Bunch of 12 two-tone blue fabric rose buds with sturdy paper wrapped wired stems. Flowers measure 5/8" high. Measure 4-1/2" long overall including the stem. Old store stock made in Germany. 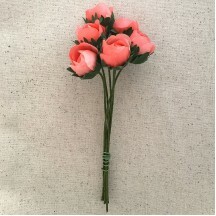 Bunch of 12 pink fabric rose buds with sturdy paper wrapped wired stems. Flowers measure 5/8" high. Measure 4-1/2" long overall including the stem. Old store stock made in Germany. 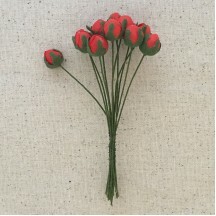 Bunch of 12 red fabric rose buds with sturdy paper wrapped wired stems. 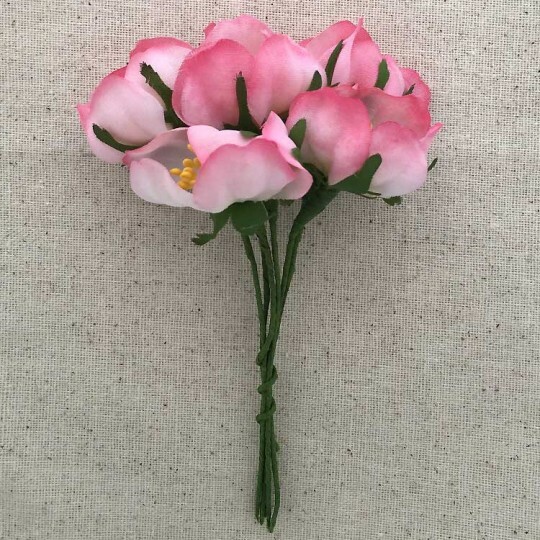 Flowers measure 5/8" high. Measure 4-1/2" long overall including the stem. Old store stock made in Germany. 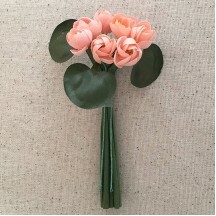 Bunch of 6 mixed peach fabric ranunculus with sturdy paper wrapped wired stems. 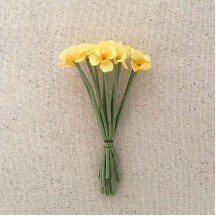 Flowers measure 1" high x 7/8" across. Stems measure 6" long overall. Old store stock made in Germany. Bunch of 6 peach fabric ranunculus with sturdy paper wrapped wired stems. 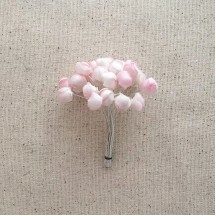 Flowers measure 1" high x 7/8" across. Stems measure 6" long overall. Old store stock made in Germany. Bunch of 6 white fabric ranunculus with sturdy paper wrapped wired stems. Flowers measure 1" high x 7/8" across. Stems measure 6" long overall. Old store stock made in Germany. Bunch of 6 yellow fabric ranunculus with sturdy paper wrapped wired stems. 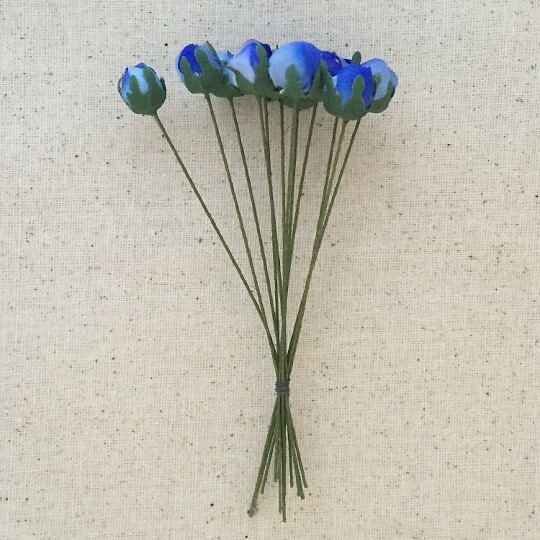 Flowers measure 1" high x 7/8" across. Stems measure 6" long overall. Old store stock made in Germany. 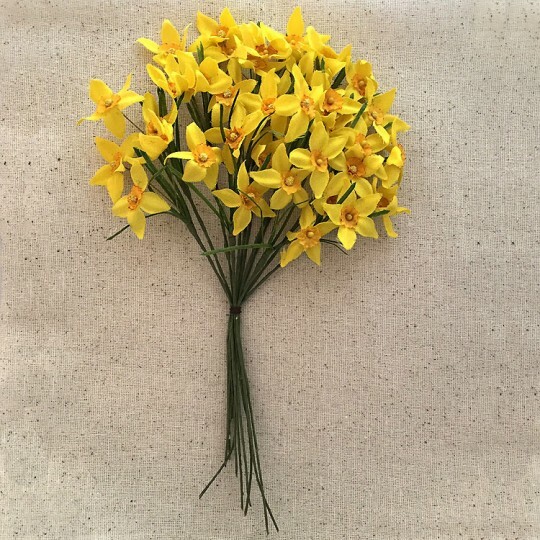 Beautiful spray of yellow fabric narcissus has 12 stems that can be separated -- each stem has 3 flowers for a total of 36 blooms. 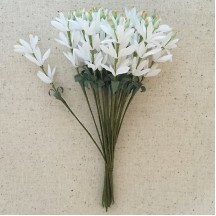 Flowers measure 1-3/8" across. Bundle measures 9" long overall. Old store stock made in Germany. Bundle of 10 old store stock vintage fabric crinkle buds in white. Buds measure approx. 1/2" to 5/8" across with green wired stems measuring 2" long. Old store stock made in Germany. 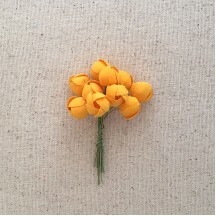 Bundle of 10 old store stock vintage fabric lantern buds in golden yellow. Buds measure approx. 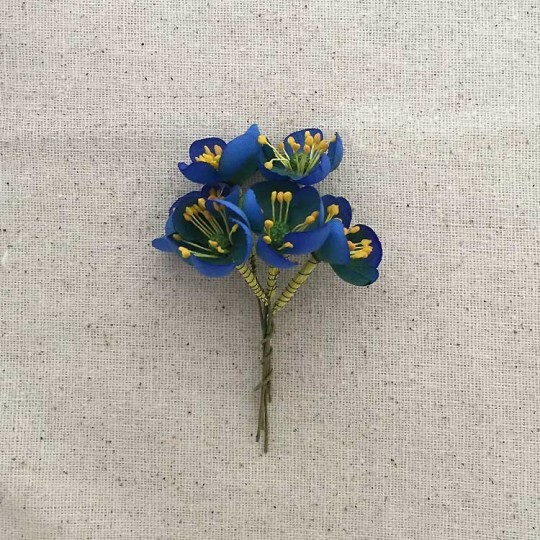 1/2" across with green wired stems measuring 2" long. Old store stock made in Germany. 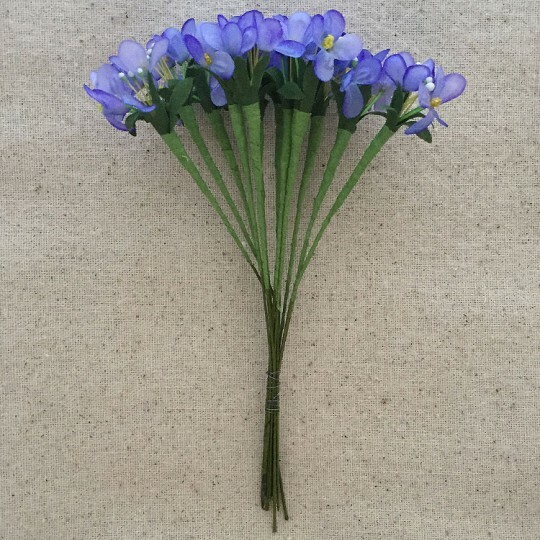 Bundle of 12 old store stock vintage fabric flowers in purple. Blossoms measure approx. 5/8" across with green fabric stems measuring 3-1/2" long. Old store stock made in Germany. 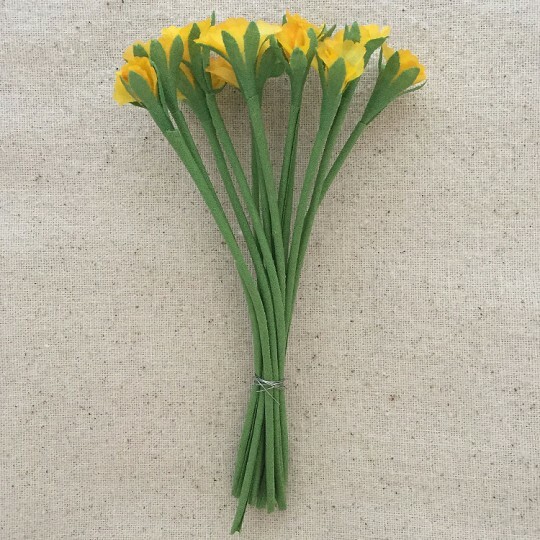 Bundle of 12 old store stock vintage fabric flowers in yellow. Blossoms measure approx. 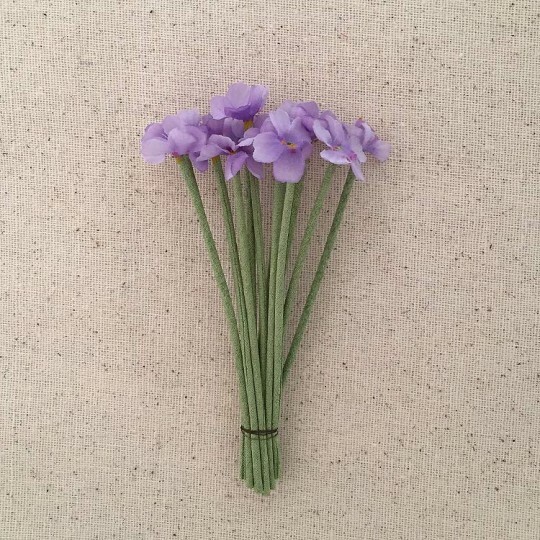 5/8" across with green fabric stems measuring 3-1/2" long. Old store stock made in Germany. 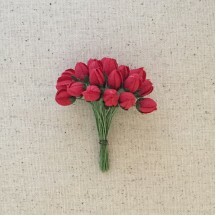 Bundle of 24 old store stock vintage fabric buds in red. Buds measure approx. 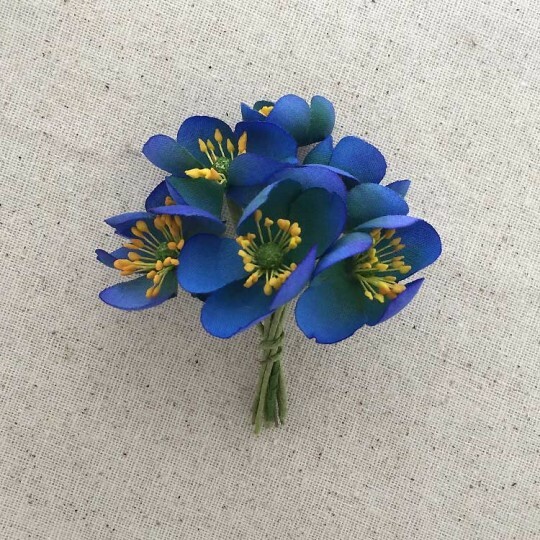 1/2" tall with green wired stems measuring 2" long. Old store stock made in Germany. These may show some glue in the folds of the buds from the manufacturing process. 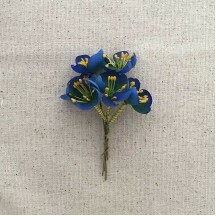 Bundle of 6 old store stock vintage fabric apple blossoms in blue. Blossoms measure approx. 1/2" to 3/4" across with wired stems measuring 2" long. Old store stock made in Germany. Bundle of 8 old store stock vintage fabric apple blossoms in blue. Blossoms measure approx. 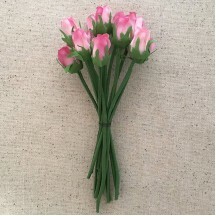 1" to 1-1/2" across with green wrapped stems measuring 2-1/2" long. Old store stock made in Germany. 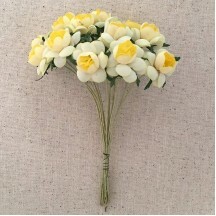 Petite bundle of 24 old store stock vintage satin buds in pale yellow. Buds measure approx. 3/8" across with white wired stems measuring 2" long. Old store stock made in Germany.